We are a fifth-generation family farm, specializing in home-grown produce on 700 acres. Stop in for our fresh produce, baked goods, ice cream, homemade fudge, gifts, pantry, and more. Our petting farm has over 75 animals and we pride ourselves as having one of the nicest, cleanest petting farms you will ever see! Outdoor activities include jumping pillows, bird aviary, ball zone, gem mining, barrel train rides, pedal carts, barrel horses, unique playground, animated chicken show & more! 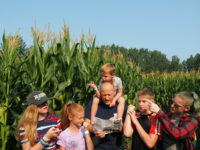 In the fall visit our 6-acre corn maze, pig races, dog show, enjoy a wagon ride and shoot the fruit cannons at Bunker Hill. Visit our website or Facebook for more information. Welcome to another season of fabulous fun and flavor at Lewis Farms & Petting Zoo! Enjoy Mother's Day at the farm! Father's Day At Lewis Farms & Petting Zoo! West Michigan's Favorite Camel Is Having A Birthday Party! Our Corn Maze is OPEN for the season! Come explore the new design!